Learn how to work with nature to create a more sustainable world! Earn a Permaculture Design Certificate while gaining hands-on experience at the Alderleaf campus and learning nature awareness skills. The Permaculture Design Course is an intensive course focusing on permaculture design principles, nature awareness & ecology, and sustainable living skills. During the course we will be spending three days at the esteemed Bullock's Permaculture Homestead on Orcas Island! The Bullock Brothers, Doug and Sam, will be instructing while we're on the property, so you can benefit from their 35+ years of experience. If you want to learn from the Bullocks this summer, this is your chance! The course blends permaculture principles with a holistic knowledge of nature where theory is put into practice. You gain the knowledge and skills needed to design and implement sustainable living systems in balance with natural ecosystems. 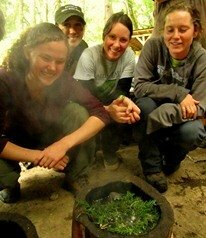 Each class day is a blend of instruction and experiential learning with projects on the farm and in the forest. Through this course you become proficient at applying nature-based permaculture design for both personal and professional use, to promote healthy communities and a meaningful, fulfilling lifestyle. Upon completion of the course, you receive a Permaculture Design Certificate, an internationally-recognized credential for sustainability. The permaculture design course takes place at Alderleaf Farm in Monroe, WA with a three day trip to the Bullocks Permaculture Homestead on Orcas Island, WA. The beautiful 15-acre Alderleaf property is nestled in the foothills of the Cascade Mountains 35 miles east of Seattle. It is an evolving model of environmental sustainability and features our classrooms, office, two homes, cabins, ponds, a large creek, forested land, pastures, many gardens, chickens, sheep, and food forests. Location: Based out of our campus in Monroe, WA in the Seattle / Puget Sound Region of Washington State in the Pacific Northwest; with a three day trip to the Bullocks Permaculture Homestead on Orcas Island. Duration: Sixteen days with a one-day break mid-course. Classes run all day with optional evening sessions. Course Fee: $1795. Includes all instruction, on-site camping, and breakfasts/lunches. Suggested Reading: Mollison, Bill. Introduction to Permaculture. 2002. Bloom and Boehnlein. Practical Permaculture: For Home Landscapes, Your Community, and the Whole Earth. 2015. To Register: Visit our Course Registration Page. Optional Further Study: For continued study of nature skills and sustainability, the Alderleaf Wilderness Certification Program offers a comprehensive curriculum. Questions / More Information: Please visit the Frequently Asked Questions page and feel free to contact us if you need further information. Why complete a Permaculture Design Certificate at Alderleaf? Having a firm grasp of nature awareness & ecological principles is a vital component in becoming an effective permaculturist. Permaculture is a design system based on ecology, the relationships between natural systems. 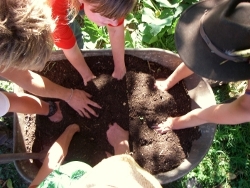 What makes the Permaculture Design Course at Alderleaf unique is that ecological principles and nature skills are taught alongside the standard permaculture design curriculum. This key foundation of knowledge enables you to become a more competent permaculturist. Dave Boehlein: Dave also instructs the permaculture design component of the Wilderness Certification Program at Alderleaf. He is the principal at Terra Phoenix Design, where he helps clients around the globe achieve their sustainability goals through integrated master planning. 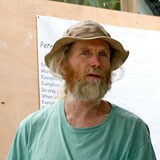 He also serves as the Education Director at the 30 year old Bullock’s Permaculture Homestead on Orcas Island, WA. His freelance “gun-for-hire” teaching services are highly sought after by organizations including universities, non-profits, and trade associations. Dave holds a B.S. in Natural Resources & Environmental Studies from the University of Minnesota. He worked in outdoor education for a number of years and while guiding eco-tours in Costa Rica he stumbled upon permaculture design. He jumped in with both feet and hasn’t looked back since. Dave is passionate about plants - especially weird, but useful ones. He also loves mushroom hunting, plays games of all kinds, and works to mainstream permaculture with integrity. Doug Bullock: Since 1982, Douglas Bullock has lived with his extended family, friends, and skill builders on their permaculture site on Orcas Island. Douglas has facilitated or directly participated in comprehensive Permaculture projects and classes at their site and at sites around the world, including Australia, New Zealand, Hawai'i, Costa Rica, the Bahamas, Nicaragua, California and Washington. Having traveled extensively collecting and studying agricultural systems, he is familiar with a wide range of climate strategies and crops. His specialties include permaculture design, tree crops, nursery practices, creating small and large-scale wetland environments, and implementing appropriate technologies. 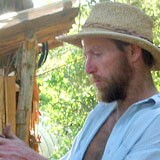 Douglas has also written articles and pamphlets on permaculture featured in the Permaculture Activist and in the International Permaculture Journal. Sam Bullock: Sam grew up squeezed under the armpits of his two enthusiastic older brothers. Always interested in the natural world (frogs, snakes, turtles, salamanders, etc. ), their transition to growing plants as teenagers in the 70's led directly to growing food plants and to the awareness of a holistic, spiritual, sacred, and natural world of which we are all a part. Sam has been professionally landscaping for the last couple decades, as well as co-developing the homestead on Orcas Island and working on the occasional tropical project. He is energized by working with plants, rocks, earth, water, wood, animals, and of course people!